Wyoming law against data collection: Protecting ranchers by ignoring the environment. 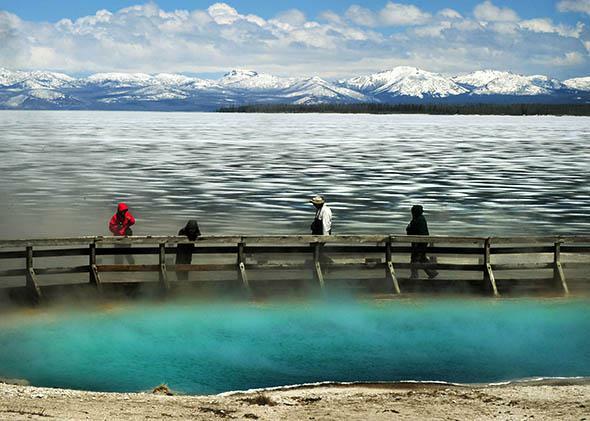 A hot spring and partially frozen Yellowstone Lake in Yellowstone National Park in Wyoming in June 2011. Under a new Wyoming law, a photo like this could now be illegal. Wyoming doesn’t, of course, care about pictures of geysers or photo competitions. But photos are a type of data, and the new law makes it a crime to gather data about the condition of the environment across most of the state if you plan to share that data with the state or federal government. The reason? The state wants to conceal the fact that many of its streams are contaminated by E. coli bacteria, strains of which can cause serious health problems, even death. A small organization called Western Watersheds Project (which I represent pro bono in an unrelated lawsuit) has found the bacteria in a number of streams crossing federal land in concentrations that violate water quality standards under the federal Clean Water Act. Rather than engaging in an honest public debate about the cause or extent of the problem, Wyoming prefers to pretend the problem doesn’t exist. And under the new law, the state threatens anyone who would challenge that belief by producing information to the contrary with a term in jail. The Clean Water Act and other federal environmental laws recognize that government officials lack the resources and sometimes the political will to address every environmental problem. Ordinary citizens therefore play an integral role in carrying out these laws. The statutes authorize citizens to bring lawsuits against polluters and recalcitrant government agencies, and citizen scientists have long played an important role in gathering information to support better regulations. The Wyoming law transforms a good Samaritan who volunteers her time to monitor our shared environment into a criminal. Idaho and Utah, as well as other states, have also enacted laws designed to conceal information that could damage their agricultural industries—laws currently being challenged in federal court. But Wyoming is the first state to enact a law so expansive that it criminalizes taking a picture on public land. Anyone with a passing familiarity with our Constitution will recognize that the Wyoming law is unconstitutional. It runs afoul of the supremacy clause because it interferes with the purposes of federal environmental statutes by making it impossible for citizens to collect the information necessary to bring an enforcement lawsuit. The Wyoming law also violates the First Amendment’s guarantee of free speech because it singles out speech about natural resources for burdensome regulation and makes it a crime to engage in a variety of expressive and artistic activities. And finally, it specifically criminalizes public engagement with federal and state agencies and therefore violates another right guaranteed by the First Amendment: the right to petition the government. By enacting this law, the Wyoming legislature has expressed its disdain for the freedoms protected by the First Amendment and the environmental protections enshrined in federal statutes. Today, environmentally conscious citizens face a stark choice: They can abandon efforts to protect the lands they love or face potential criminal charges. The United States government should not sit idly by. It should plainly express its disapproval of this law. Ideally, this would entail the U.S. Department of Justice filing a lawsuit to invalidate the Wyoming law, much as it did when it challenged Arizona’s state immigration law as unconstitutional. At the very least, the federal agencies that manage public lands should issue written statements providing express permission for citizen scientists to continue their efforts to protect our shared environment.